This XF/X250 R Sport 200 BHP Estate is finished in Glacier White, gloss black wheels along with full Black Heated electric memory leather seats. 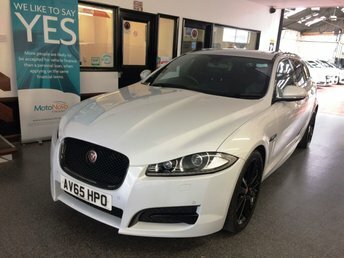 It is fitted with power steering, Jag Satellite Navigation/Reverse Camera/Phone, LED Day Lights, Bi Xenon lights, automatic gearbox with paddle shift option, electric windows and mirrors, climate control, cruise control, telephone, front & rear parking sensors, alloy wheels, Meridian Sound Upgrade with DAB/ DVD - CD Stereo with Aux port and more. Jaguar is a name synonymous with style, performance and refinement. Here at Crossways Garage Ltd you'll find an excellent selection of used Jaguar cars for sale in Halstead, all of which come fully inspected to ensure complete peace of mind. Whether you're looking for a pre-owned executive saloon such as the Jaguar XF, an SUV with the style of the Jaguar F-PACE or a pure sports car like a Jaguar F-TYPE, we'll be able to find the right used Jaguar to meet your requirements. Get in contact with a member of the team today for more information and to book a test drive in the model of your choice.